Filipinos are mostly fond of eating rice for breakfast. It runs in our veins so much so that at the end of the day, no matter what we have eaten, still our last recourse is to eat rice. Our day wont be complete without it. Not unless, you are trying to lose weight or for whatever reasons you decided not to eat rice. There is one particular dish that we use to eat for breakfast but in the end it became so famous that most of us would eat any time of the day. We call this Tapa or cured meat which now comes in variety. When I was young, Tapa is a cured beef. The good old days, it was cured with salt and vinegar but it was really good. Perhaps the only reason for making tapa is to prolong the shelf life of meat, the way of storing and preserving for future consumption. I remember it was salty and tough, kinda chewy but it was so good. Fast forward... 1990's, Tapa came out with fried egg and fried rice, with achara and vinegar. More so, it was popular that these days, everywhere in the Philippines, big and small restaurant, there is tapa dish. How did it came to our country.. well, theres a little history..
Tapa is dried or cured beef, mutton, venison or horse meat, although other meat or even fish may be used. Filipinos prepare tapa by using thin slices of meat and curing these with salt and spices as a preservation method. Tapa is often cooked fried or grilled. When served with fried rice and fried egg, it is known as tapsilog (a portmanteau of the Filipino words tapa, sinangag and itlog egg). It sometimes comes with atchara (pickled papaya strips) or sliced tomatoes as side dish. Vinegar or ketchup is usually used as a condiment. Just like any other ulam (main dish) in Filipino cuisine, tapa is usually partnered with rice. It can be garlic rice, java rice, plain rice or any other types of preparation. As a side dish, tapa sometimes comes with atchara(pickled papaya strips) or sliced vegetables (usually tomatoes). Vinegar (oftentimes with siling labuyo) or ketchup is usually used as a condiment. Tapsilog is the term used when tapa, garlic-fried rice (sinangag), and fried egg (itlog) are combined into one meal, which is served primarily during breakfast. The word tapa is related to the Sanskrit term tapas which means "heat". In Tagalog, a restaurant that primarily serves tapa is called a tapahan, tapsihan or tapsilugan. According to some sources, tapsilog and tapsihan are colloquial slang words. However, these terms are used by those restaurants and many Filipinos of all social strata. Tapsilog and tapsihan, therefore, may be considered standard words in the Filipino language rather than slang.It was originally intended to be quick breakfast fare and the word originally established in 1980's and came from the famous Tapsi ni Vivian restaurant in Marikina City. According to Vivian del Rosario, owner of Tapsi ni Vivian, she was the first to use the term tapsilog. Nowadays, we created our own version of Tapa. In my case, I opted to use chicken meat because its healthier compared to beef and pork. But both of these two meats I have done and enjoyed preparing in my kitchen. 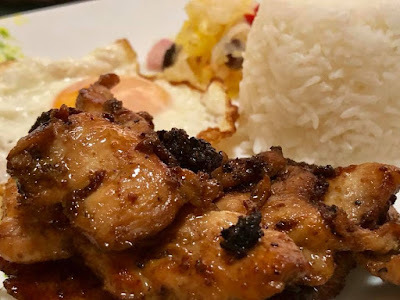 Since my children are both fond of chicken meat, I decided that Chicken Tapa is ideal for us. In a pan, add some oil and pan fry the meat until its brown. You can actually grill these chicken slices. I think that when we became migrants, we left our homeland but we still crave and long for the food back home. For that reason, we tried to create our own and it depends upon the availability in a certain place. Singapore is a chicken country, it is affordable and cheap. Fast life calls for fast recipes, food and cooking should be simple and adaptable to our lifestyle here. Yes, you should really try it for a change. You can actually cook it in three ways, pan fry, grill or barbecue. Enjoy your summer! Thanks for coming over. Looks delicious! I do like rice, but don't cook it real often. Thanks for sharing with SYC. Your Filipino Chicken Tapa looks delicious! Hope you are having a great week and thanks so much for sharing your awesome post with us at Full Plate Thursday!